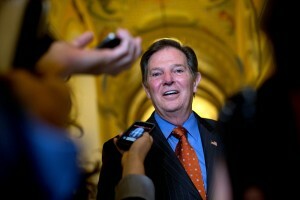 Former US House Majority Leader Tom DeLay, the mastermind of a permanently red Texas. As 2014 draws to a close, one thing of which I am certain is you do not need to read another story about the variety of reasons Texas did not turn blue – or mauve or any shade of purple – this year but instead went from pretty darn red to “red concentrate” with a shiny clear coat to give it that stunning candy apple redness that teenagers dream about on their first car. The narrative about a possibly purple Texas is the yarn spun by capable national journalists who parachuted into places like Dallas/Fort Worth, Houston or The Valley for several days at a time. Many of them were shocked by the results on election night, wondering what happened when the voters in a state with 254 counties and 22 media markets spread over two time zones did not change partisan allegiances within 18 months. But, it was no surprise to many of those with a memory that goes back at least a decade beyond the abortion filibuster of 2013. The storyline of a state that might be in play for Democrats was so powerful and the threat to Republicans seemed so imminent that, in one of the niftiest political feats I’ve witnessed, Sen. John Cornyn was able to fend off seven, yes seven, Tea Party challengers through his “Keep it Red” Campaign. Cornyn effectively secured 60 percent of the GOP base vote by running against Battleground Texas instead of the passel of “true conservatives” actually on the ballot against him. One thing to be learned from this year’s results is that the idea of transforming Texas into a competitive battleground for national Democrats in a presidential contest is not an organizing principle for people who would not normally vote in an off-year election. It might be counterintuitive, but there is little logic in assuming that folks who only vote in presidential years care enough about politics to be passionate about the goal of awarding Texas’ electoral votes to one party or the other. Not only did President Obama’s coalition of millennials, women, and minorities fail to vote, it was almost as if they wrote “Don’t Vote Today” on their calendars for November 4. Quorum Report readers will, I hope, give us credit for our consistent focus on the real political story of the year in Texas politics: The business community’s clash with the Tea Party, which has had mixed results and sets us up for what’s sure to be a fascinating 2015 session of The Legislature. There is also the question of how much of that Tea Party “movement” is actual grassroots conservatism as opposed to the phony AstroTurf created, in part, by Midland oilman Tim Dunn’s Empower Texans and allied organizations like Texas Right to Life. How did we get to the point in our history when the battle within the Republican Party is the only game worth watching? You have to go at least as far back as the bitter partisan fight in 2003 over redistricting that created a system in which the only election of consequence is the one in March, not November. Add to that the fact that Democrats pulled out of Texas financially after Rick Perry narrowly defeated John Sharp for Lt. Governor in 1998 and Democratic gains leading up to 2010 were erased by backlash against President Obama and you’re left with a minority party hollowed out at the state level. This year’s results make that as clear as ever, with Sen. Wendy Davis, D-Fort Worth, pulling only 39 percent to Republican Greg Abbott’s nearly 60 percent. Abbott ran a disciplined campaign that rarely made the mistake of telling us what kind of governor he will be. While Davis’ campaign almost seemed to be running against themselves at times – offering multiple messages filled with far too many specifics for sound bite-driven news cycles – extracting the details of any plans from Abbott have been difficult to come by, even after his resounding win. For example, when Quorum Report recently reported that Abbott has repeatedly said he’s against toll roads, which is true, we received almost immediate pushback from a well-placed transportation lobbyist who told us we were incorrect. That lobbyist explained that while Abbott has outlined a plan for $4 billion annually in additional money for transportation without tolls, that does not mean he is against all tolled lanes. Abbott’s press shop, however, did not respond to our requests to clarify his position. Perhaps we’ll all find out together what kind of toll road projects Abbott supports when he supports them. Staying with transportation, Abbott ran a brilliant, if dishonest, television advertisement in which he said he could roll his wheelchair along some Texas freeways faster than the cars are moving. That is true, and funny, but Abbott also said in the advertisement that gas tax diversions used to pay for the “pet projects” of lawmakers need to be ended. The main “pet project” Abbott was referring to, of course, is the Department of Public Safety, which is busy securing the Texas-Mexico border. It will be difficult for policymakers to craft real solutions for our rapidly-growing state’s transportation infrastructure needs until an adult conversation is had by the leadership. Abbott, you may recall, is also the same candidate who said during a televised debate in Dallas/Fort Worth that Texas should create the best public school system in America and then figure out how to pay for it. You get the picture. Probably more revealing of the true nature of Texas’ political landscape was the victory of Lt. Governor-Elect Dan Patrick over Sen. Leticia Van de Putte. Patrick had about the same margin of victory as Abbott, but at least Abbott did a little bit of campaigning to earn it. Patrick made very few public appearances after winning the GOP primary runoff and only debated Van de Putte once. Patrick spent the vast majority of his money and put his sweat equity into the primary, where he dominated the conversation with talk of an “invasion” from Mexico and cutting property taxes. The reasons Patrick did not need to campaign, and really didn’t have time for it, are that he had already won the election that mattered and he was busy building a government. By the way, key hires he has announced, including veterans like Mike Morrissey and Walter Fisher, have given some assurance to the Capitol community that Patrick intends to be consequential and not simply someone who throws red meat to the conservative base. Patrick’s background as a radio talk show host means he will likely be able to cast whatever the Texas Senate does in the most conservative terms possible, regardless of the policies advanced under his leadership. Patrick is said to have higher aspirations. If he is to achieve his future goals, one has to believe Patrick will need to preside over something that at least has the appearance of a functioning government. Speaking of Patrick, has anyone else noticed he is the only politician to enjoy an electoral victory thanks, in part, to Sen. Davis’ filibuster of anti-abortion regulations? We now know that the filibuster did not signal the rise of Davis as much as it represented the political implosion of Lt. Gov. David Dewhurst. Patrick was able to hang that night’s events around the Dewhurst’s neck, helping him win the GOP primary to preside over the Senate. It is in that chamber where the Democrats finally surrendered following the last quorum bust of 2003’s redistricting fight. It was Sen. John Whitmire, D-Houston, who during a third special session returned from New Mexico – where members of the minority party had been hiding out – so that he could make a deal with the Republicans and finally end the standoff over the state’s political lines. 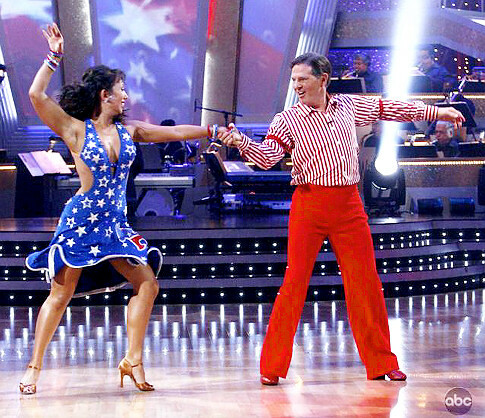 Former Rep. Tom DeLay, R-Sugar Land, performing on ABC’s Dancing with the Stars. When former U.S. House Majority Leader Tom DeLay, R-Sugar Land, hatched the plan to redraw Texas’ political boundaries, the first step was a GOP takeover of the Texas House. Years before DeLay performed on ABC’s Dancing with the Stars, he formed a group called Texans for a Republican Majority and was later accused of money laundering in an alleged scheme to use corporate dollars in Texas House elections. After the GOP took control of the House for the first time since Reconstruction, DeLay was given an office in the Texas Capitol where he whipped the members to “win one for George W. Bush” and create a permanent Republican majority. Setting aside for a moment the legal battles that ensued, including the criminal prosecution of DeLay for money laundering, recent elections suggest DeLay got his wish. When Republicans were damning the torpedoes in the name of redistricting all those years ago, what they were growing in a political petri dish was Sen. Ted Cruz. Or, at least someone like him. Someone who now seems relegated to irrelevance in the United States Senate but remains a hero to the Republican base because he always says and does exactly what they want. Cruz brings to the national stage the conservative rhetoric of DeLay with the actions to back it up. He’s the Senator who says he will vote no on just about everything and then actually does it. Sure, DeLay would talk about “limited government,” but as Majority Leader he delivered the GOP votes to create a prescription drug benefit under Medicare. At the time, it was the largest expansion of entitlements in our nation’s history. Cruz talks about smaller government and then shut down the government in his unsuccessful quest to undo reforms to health care. Cruz’s rhetoric, like Dan Patrick’s, propelled him to victory over Dewhurst in a Republican primary, securing his win in the general election where Democrats have been made irrelevant. And at the same time, the past few years have revealed more than ever that the mid-decade redistricting of 2003 has created some fundamental disconnects between Texas communities and the people chosen to represent them in Austin and Washington. It’s the reason Sugar Land was among the first big suburbs to ban smoking in public places while their Congressman, DeLay, was often treated to junkets paid for by tobacco lobbyists. What would the congregation at any Church of Christ in Fort Bend County think of that? The distorted political lines of the state are also why the Plano City Council earlier this month approved an anti-discrimination ordinance while that suburb’s delegation to the Texas House is comprised entirely of conservative Republican representatives who oppose the measure to extend protections to gays, lesbians and others. Northeast Tarrant County is one of the fastest growing areas on Earth, and yet is also home to a Texas House delegation overwhelmingly and vocally opposed to infrastructure investment. Fort Worth, the 17th largest city in the United States and fifth largest city in Texas, will not have a State Senator who lives in it. Senator-Elect Konni Burton is from Colleyville. It’s simple: If you draw political lines around segments of the community, very conservative pockets of support appear. If the line drawn around the community is the city limit, you find that Texans are right-of-center but still fairly moderate, business-minded people. That’s evidenced by the 5-3 passage of Plano’s equal rights ordinance. Other cities have taken similar steps and have elected leaders who support those measures. Cities have similarly led the charge against the predatory practices of payday lenders. At the Capitol in Austin, however, the “conservative” argument centering on the personal responsibility of the customer carries the day. Local governments and hospitals favor Medicaid expansion under the Affordable Care Act but the leadership in Austin has deemed it unacceptable because it has “the taint of Obamacare.” Local law enforcement has pleaded with state lawmakers to give driver’s licenses to undocumented immigrants and reject policies that would force them to enforce federal immigration laws. So far, The Legislature has pretty much steered clear of immigration but 2015 could be a different story. Copyright December 29, 2014, Harvey Kronberg, www.quorumreport.com, All rights are reserved. Reprinted with permission.